Home » How to Rank Higher on Google Search? Search engine optimization (SEO) can and will be paramount to every business’ success. 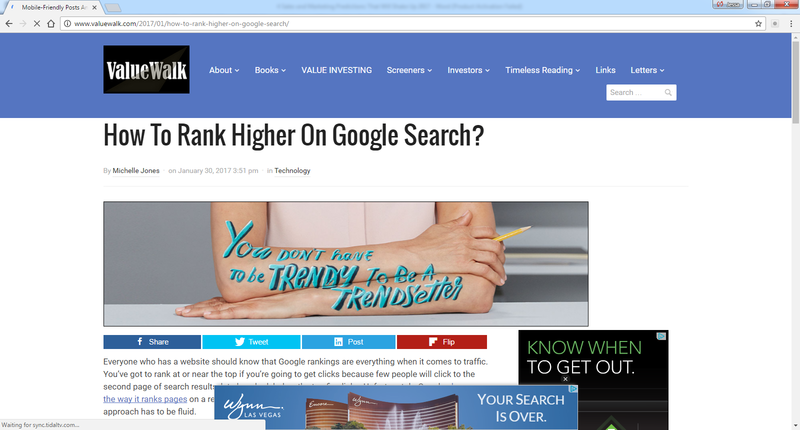 When ValueWalk asked me and other SEO pros on our best tips, I suggested that smaller websites pinpoint niche topics rather than trying to tackle the giants. For example, if you’re a local brick and mortar bookstore, your SEO keyword variant shouldn’t include “books” because you’ll be competing with the likes of Amazon and Barnes and Noble. Instead, go for those less popular keywords and long-tail key phrases so that you can be competitive. SEO isn’t just about getting ranked at the top for the “best” words, but those that align with your business and goals. Consider going hyper-local, especially if you have a brick and mortar establishment. Consider what niches your customers might be searching for. It’s simpler, faster and much less stressful to focus on less common keyword phrases. Also keep an eye on mobile-ready pages because that’s garnering more attention from Google and other search engine algorithms. Mobile is an aspect of SEO that’s often overlooked, and now that mobile searches are the most popular, it’s more critical than ever.